Don’t let a setback (however major) stop you – After founding Apple in the 1970’s, Jobs lost a power struggle in 1984 which resulted in him resigning from the company. He didn’t and returned to the company 12 years later, going on to become the CEO in 1997. This lead to the glory era of Apple, with the launch of the iPod revolutionising the music industry. We all go through disappointments in life, some greater than others. We could let such disappointments write the script for the rest of our lives, or we could use Jobs as a role-model for making a glorious comeback. Aim for the wow factor – When you first look at a new Apple product, it has a definite wow factor. The design and functionality are immediately impressive. A mate of mine recently got an iMac and he was so mesmerised by the packaging that he forgot to use his new toy. And then there are Steve’s presentations. They are the stuff of legend, with millions tuning from around the world to witness for themselves the newest creation from Apple. Do you settle for OK, when you could aim for greatness? Do you aim for good enough, when you could stand out from the crowd? What can you do that will make people take notice and say “wow”? Push on, even when you don’t feel like it – Steve was diagnosed with pancreatic cancer and received a liver transplant in 2009. Despite such poor health, he was the main driver behind some of the amazing initiatives such as the iPhone and iPad. He continued to innovate and inspire despite his situation, driving himself when he has a perfectly reasonable excuse to just mail it in. Sometimes, we don’t feeling like delivering great work. Sometimes, we don’t even feel like turning up to the office. Sometimes, we have a little sniffle or a mild headache and that’s enough for us for us to excuse a below-par performance. Jobs reminds us that we can still perform to a high standard, even when we don’t feel like it. To me, Steve Jobs was an inspiration because he has been able to come back from setbacks, continue to astound us with his products and persevere when he didn’t need to. The world was rocked by his death, but his legacy will live on for years. 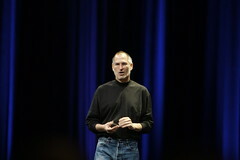 What has inspired you the most about Steve Jobs? I think he had a great attitude and just what you shared here spoke of a humbleness. 🙂 Thanks for encouraging us to push through the hard stuff!